DS Arms complete PARA conversion kit allows you to take your fixed stock FAL rifle and convert it into the PARA folder you have always wanted! This kit includes all of the components required in order to convert your fixed stock FAL to a PARA folding stock FAL. Additionally this conversion kit features our new DS Arms B.R.S. - Battle Rifle Stock; this new stock provides more adjustment and features then any previous stock offered for the FAL rifle. The B.R.S. has length of pull adjustment, cheek height cant and adjustment, multiple QD sling pockets and a rubber buttpad. Forged 7075-T6 Aluminum PARA ower trigger frame, includes Hardcoat MIL-A-8625F Type III, Class 2 Anodized Finish. 4140 Fully heat treated PARA bolt carrier, includes Mil-Spec phosphate finish. PARA Recoil spring set; includes 2 inner springs, inner connecting tube and outer spring. PARA Dual aperture rear sight assembly, 150-250 Meter. Extreme Duty Standard Length PARA Scope Mount, includes guide rod and mounting hardware. PARA connecting bolt with internal set screw. B.R.S. - Battle Rifle Stock. Complete set of metric internals, includes the hammer, trigger, sear, semi auto selector switch, metric pistol grip and all other lower trigger frame internals. 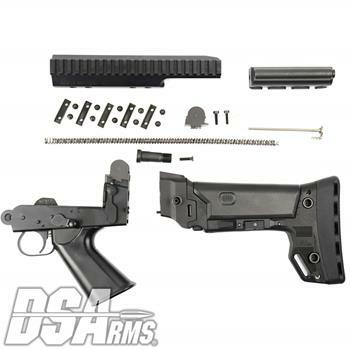 This PARA conversion kit counts as 7 U.S. Made parts for 922R Compliancy, the trigger frame, bolt carrier, stock, pistol grip, hammer, trigger & sear. Assembled To Order, Please Allow 2-3 Weeks For Shipment.